Get your geysers off peak demand times with the New Plug N' Play Geyser timer! You are here: Home / Featured Stories / Get your geysers off peak demand times with the New Plug N’ Play Geyser timer! Get your geysers off peak demand times with the New Plug N’ Play Geyser timer! As ESKOM struggles to keep the lights on, they have repeatedly requested consumers to reduce their demand during peak times. This is typically between 6am and 8am and between 6pm and 8pm. Of course, this is when most families are getting up to get ready for school and work and coming from same and preparing dinner and bathing. One of the biggest users of power in this time are geysers and we need them so we can have those morning showers , hot water for the dishes and then again in the evenings for the pre-bed bathing and post dinner washing up. So, how can we still have hot water , but only operate our geysers before and after peak demand times? The Control Panel inside the new Plug N’ Play Timer. Many of you have either had geyser timers installed or are considering having one installed. At Saving Energy , we have installed hundreds of timers over the past few years and now we have a new one. For some folks, programming a geyser timer is not something they want to do. Ever. They simply want one that can be installed and do it’s job without having to be amended or changed. The good news is, that timer is here. A few years ago, ESKOM rolled out the RMR (Residential Mass Rollout) programme. It’s intention was to supply energy saving products to consumers free so that energy use could be reduced. During that time , they worked with Hellermann Tyton to develop a timer that was PRESET to switch off geysers and Pool Pumps during the peak demand hours. This would reduce strain on the grid and assist ESKOM in keeping the lights on. And so , the TGTLC timer was developed to do precisely that. 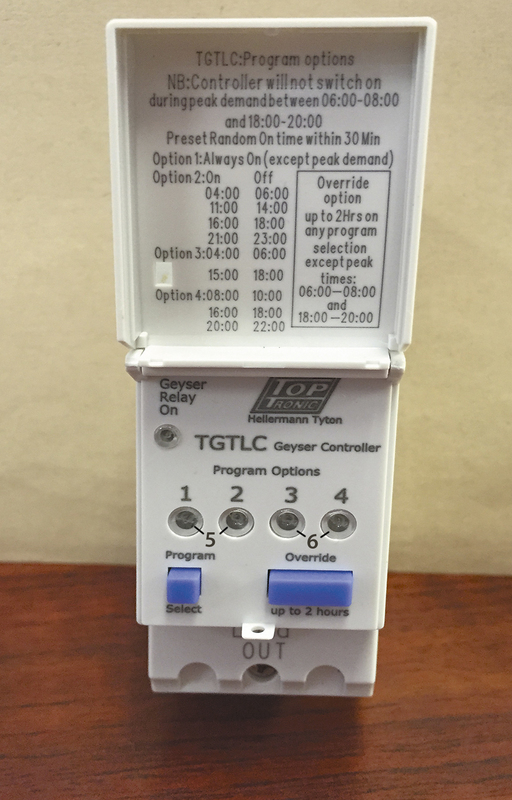 Now available on Pre-order from Saving Energy , the TGTLC timer has a number of great features. 1) Four Peak demand preset programmes giving you the choice of how and when you want your geyser to run- the timer will automatically shut down your geyser between 6am and 8am and between 6pm and 8pm. 3) A battery backup of 1 year. 4) Override option and weekend mode option. The timer will be available for installation from April and we are offering a special package deal for this new timer and geyser blanket as an introductory offer! See below on how to pre-order. Make it more effective and save more electricity and money! Well, I have to say , that’s a great idea and everyone can now help ESKOM out! To enhance the savings using this product, we would suggest adding a geyser blanket as well. The blanket simply helps to reduce heat loss from the water in the geyser once it is at temperature , so when the geyser does switch back on, it is using less electricity to heat the water back to temperature. So, with this new timer, you can simply have it installed and forget about it , knowing that you are contributing your part to keeping South Africa’s lights on. Click the button below to Pre-order your TGTLC Plug N’ Play timer and Geyser blanket package and Save R100! Or fill in this form and we will contact you by email to confirm your pre-order.